L-R: Philippos Saba, Pavement Engineer, AECOM; Adrian Coy, a former ICE Vice-President; Dan Willmott, Project Manager, Defence Infrastructure Organisation; Paul Robinson, Air Vice-Marshal (retired). The Institution of Civil Engineers (ICE) organised a unique event, in association with the Royal Air Force, to celebrate the institution’s bi-centenary and the centenary of the RAF. 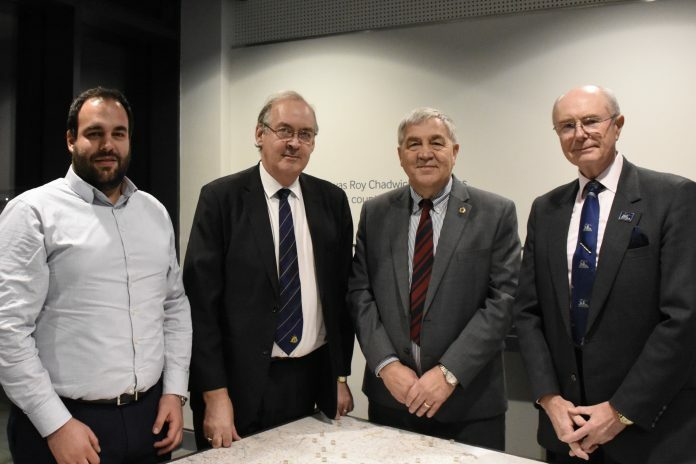 The event — which took place at the International Bomber Command Centre in Lincoln on Thursday 22 November — included a talk by Paul Robinson, Air Vice-Marshal (retired), which charted the history of the RAF and Bomber Command. Adrian Coy, a former ICE Vice-President, gave a brief history of the Institution of Civil Engineers, including its wartime role and connection with Lincolnshire’s airfields. The final presentation was delivered by the Defence Infrastructure Organisation and AECOM, which covered the recent extensive refurbishment of the runway at RAF Waddington. Around 100 people attended the event, including members of the ICE, former RAF personnel and two veteran airmen who served during the Second World War. Commenting on the event Derek Braddy, ICE Lincolnshire branch chair, said: “The event celebrated two major anniversaries and we were delighted to welcome so many people to the IBCC.